Since I began evangelizing on Twitter, Facebook, Google + and elsewhere online, many atheists have engaged me via these platforms. However, due to limitations regarding how much can be typed and the exaggerated rules regarding spam and abuse, I decided to start a new format to engage atheists on. Hopefully, online atheists will take advantage of this new format which will be live and neutral. They can address me in real time and not have to wait until I have free time to respond to their messages. Moreover, this will separate the real atheists from the trolls who pose as them on social networks. Unfortunately, many online atheists hide behind tweets and comment forums. This gives them a sense of security and many times sets up theists for trolling. I hope "Sacerdotus Hangouts: Atheist Open Mic" will counter this and truly create a platform where a discussion can be had without trolling and nonsensical postings. 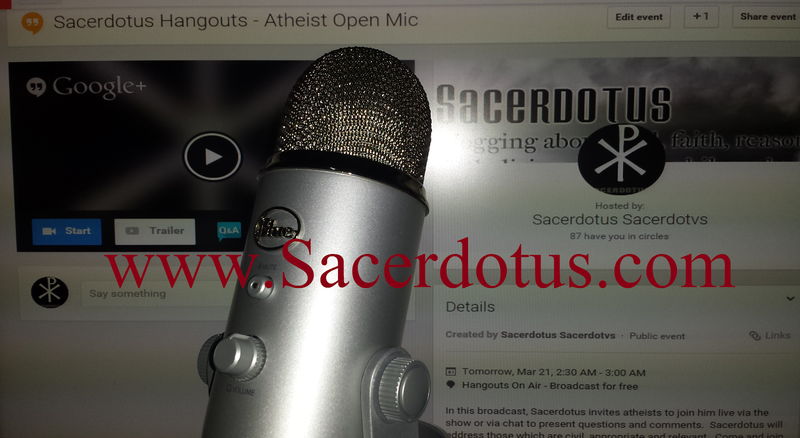 Join Sacerdotus Hangouts' Atheist open mic. In this broadcast, Sacerdotus invites atheists to join him live via the show or via chat to present questions and comments. Sacerdotus will address those which are civil, appropriate and relevant. In your email, send your name and a brief bio or introduction which Sacerdotus will use to introduce you on live. ONLY those who SEND ME AN EMAIL will be allowed to join. NO OTHER REQUESTS will be honored (comments on threads, mentions, tweets etc). You have until (date of broadcast & time) EST to send your request. I hope atheists and theists alike will join me for Atheist Open Mic when it is scheduled. This post will be updated with links to the latest broadcasts.